MnDOT officials aren't releasing many details about the proposal until a final contract is signed. Until then, the public is left to wonder about the design and whether the new bridge will be built with concrete or steel. What we do know is that the team led by Flatiron Consructors said they can build the bridge for almost $234 million and will finish it in 437 days. Those details were provided when MnDOT unsealed the bids at a public ceremony. Contractors representing the four teams and MnDOT staffers crammed into the department's cafeteria to watch the presentation. Checklists were even given out so the public could keep track of the complicated process used to score the winning bid from Flatiron and Manson. Flatiron's bid is the most expensive proposed by the four teams. The other teams bidding included Burnsville-based Ames Construction, C.S. McCrossan of Maple Grove and Walsh Construction from Chicago. Flatiron also gave the longest timeline to finish construction. Jon Chiglo, project manager for the I-35W bridge rebuild, said cost and speed were just two of the factors considered. Chiglo says the other factor was a technical score, which rates the bridge design, aesthetics, public relations and improvements to surrounding roadways. "We are very happy to have Flatiron as the team working with us to deliver this project to put this bridge and put it back into service," he said. "This score is representative of their approach and that they're a quality team that they're bringing to Minnesota to help us achieve our goal." Members of Flatiron's team gave each other hugs after they were selected. One pumped his fist in the air. This will be Flatiron's first major job in Minnesota. The company is based in Colorado and is a subsidiary of Royal BAM group, one of the largest construction firms in the world. Flatiron has built several bridges in the San Francisco area and rebuilt the Escambia Bay Bridge in Florida which was destroyed by Hurricane Ivan in 2004. Company officials were tightlipped immediately following the announcement. Linda Figg, who is on the design team that's working with Flatiron, later said they were excited about the selection. Figg wouldn't provide too many details on the design except to say the bridge will be safe and aesthetically pleasing. Regarding safety, she said it would be very redundant. That's a reference to the collapsed 35W bridge which contained no redundancies or backups to prevent a collapse. Figg, whose firm designed the Wabasha Bridge in St. Paul, says they hope to make the I-35W bridge a national model. "We use special design principals that create bridges that are in harmony with their environment, in context with their site to create a sense of place that is respectful of the infrastructure and the beautiful architecture that is in a place and the things that are important to the local community," she said. The federal government is expected to pay for most of the costs related to the bridge. But that money could be delayed as Congress wrangles over transportation funding. Gov. 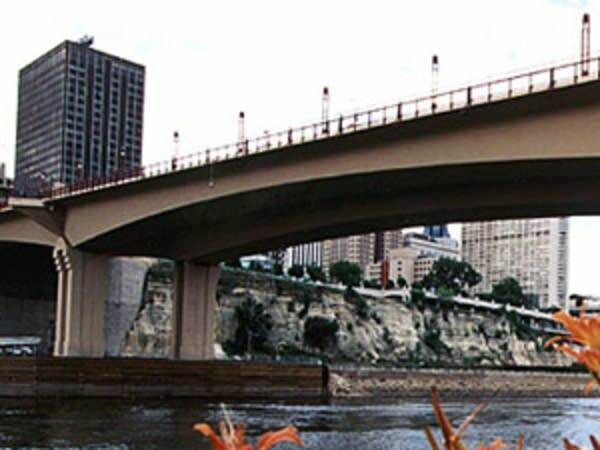 Pawlenty has said MnDOT could float itself the money until the federal funding comes through. That worries some DFL state lawmakers who say transferring money may delay other transportation projects. Rep. Frank Hornstein, DFL-Minneapolis, says MnDOT should be more open with lawmakers about their cash flow. "This issue is, what other project are being scrapped and what other projects are being delayed because the state has to front the money for this bridge? The federal reimbursements are coming in slow, as we expected. And we have asked repeatedly MnDOT to account for this. What is their cash ledger? What does their ledger say on September 19? We don't know. We need more transparency, and we need real accounting," Hornstein said. Hornstein also complained that the three losing bidders will receive a $500,000 stipend each for submitting proposals. That money is available if they allow MnDOT to use parts of their proposals in the bridge. MnDOT will now begin contract negotiations with the team led by Flatiron. They hope to have a contract signed by the end of the month and want construction to begin on October 15. That start date could be pushed back depending on how long it takes to remove the debris from the bridge that collapsed. Flatiron has said it will finish construction by the end of 2008 but there are $27 million in incentives if they finish the project earlier. There is also a financial penalty if they don't finish the project on time.